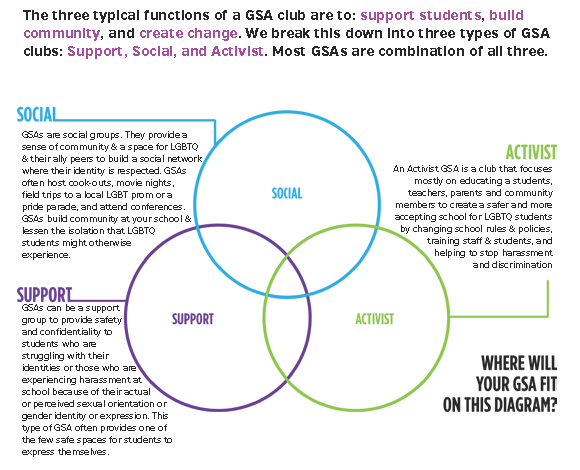 In addition to support, some GSAs work on educating themselves and the broader school community about sexual orientation and gender identity issues. They may bring in outside speakers to cover a particular topic such as LGBTQ history. They may organize a “Pride Week” or “LGBTQ Awareness Events” and offer a series of educational workshops, panels, and pride celebrations. Some GSAs organize a “Teach the Teachers” staff development day, which focuses on teaching school staff how to be better allies for LGBTQ students. There are many other types of educational and activist events that GSAs can do. Check out the Change Your School section to take action. Remember, if your GSA is at a public school, your GSA has Legal Rights under the Federal Equal Access Act. If you are in California, you have additional protection under the law AB 537.